A year ago, Eihab Seyam, his wife and their two young daughters lived in a deteriorated home in Rafah without a permanent roof or windows that closed. They suffered the harsh elements and were afraid for their security. Besides living in substandard housing, they endured medical issues. Rahma, their 1-year-old, suffers from a thoracic disease that requires her to use an inhaler three times a day. Eihab suffers from hepatitis B. The medicine they used was funded by hospitals a year ago, but now it’s not available at local clinics and very expensive to buy in the city. Eihab’s constant concern was to provide an adequate home for his family before his medical situation escalated. Eihab's family standing in their newly upgraded kitchen. Photo by Mohamed Reefi for CRS. 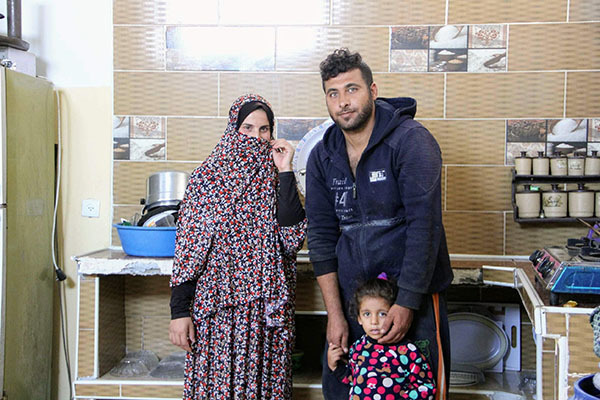 Recently, Eihab’s prayers were answered when his family was selected to participate in the Shelter Upgrade project with Catholic Relief Services. The project supports vulnerable families living in substandard housing and makes permanent upgrades to improve their living conditions. Those improvements lead to better hygiene, a safer environment and enhanced dignity—especially for women and girls, who spend most of their time in their homes. Now, Eihab is feeling alive again. After work, he is happy to come home to a comfortable place. Rahma enjoys the new amenities as well. “Now, I can walk free in my own house with full safety and comfort,” she says. “If I spent a lifetime saving money to enhance my house, I wouldn’t have done what I did through this assistance,” Eihab says. Since 2014, CRS has served 1,220 households, including 7,020 individuals, with shelter assistance in Gaza.